A recent study published in the journal Science makes a strong case for a random chance as the most important factor in cancer development. According to the study, the vast majority of cancers are just a simple error in DNA replication. If this is so, developing one of the 200 (or more) different cancers may be unavoidable, despite a “healthy lifestyle” or attempting to “boost” your immune system. The researchers found, after examining 32 different kinds of cancer, that 66% of these cancers were a result of chance mutations in cells, 29% resulted from the environment, and 5% from inheriting a mutation. If you think about the fact that the average human body contains about 50 trillion cells and that the mutation rate can be between 1 in 100 to 1 in 100 million nucleotides in humans, there can be millions of cells in the body that have some form of mutation that can lead to cancer. If I could give one piece of above average advice, it is to always be skeptical when someone makes some claim that some miracle pill or food will prevent or destroy cancer. There is no secret miracle drug out there, because, as we mentioned above, there are hundreds of cancers and trillions of opportunities for cancer to arise in your body. People want to push a narrative that there is a magic cure for all cancer, but that belief ignores basic scientific facts about cancer. Therefore, I did a search of the Cochrane Reviews, one of the best sources of systematic reviews in clinical medicine, to find if there’s anything out there that establishes that marijuana cures cancer. My search showed that there was not one systematic review of THC or cannabis in cancer therapies (although several in some neurological issues, about which I wrote elsewhere). There may be many reasons why Cochrane does not have a review on marijuana and any cancer, but mainly it’s because there just aren’t enough studies of high enough quality to roll up into a systematic review. That’s a clue, but it’s more a lack of evidence rather than solid evidence that cannabis has no effect on cancer. We can look at cancer research in another way – there are currently over 8000 clinical trials that are recruiting patients for anti-cancer drugs (and over 19000 that are closed to patients). Cannabis research is a tiny speck in the body of work analyzing compounds that may have an effect on cancer. Another myth about cancer is that researchers throw random compounds at cancer cells, and then they determine if it works or not. In fact, cancer research is a logical process to ascertain if a specific compound has a reasonable chance of inhibiting some part of cancer growth or development. There may be some potential for an ingredient of marijuana to have some effect on cancer, but it probably doesn’t compare to the other 27,000 compounds in current clinical research, and, in a business sense, the return on investment for researching compounds that have better understood pharmacologic mechanisms of action are higher. And then we have to understand the reality of cancer research. It’s important to understand that only a tiny percentage of therapeutic cancer drugs make it from an animal study to a clinical trial (about 5%). Even then, less than 10% of oncology drugs that enter clinical trials actually end up being approved by the FDA for use in humans. In other words, there’s only a 0.4% chance of any drug that’s being tested on cells or mice is going to end up being approved for human use. There are no nefarious conspiracies among the FDA, CDC, Big Pharma, and the Illuminati attempting to suppress these drugs. It’s that the vast majority of clinical trials studying these compounds fail to show effectiveness beyond their safety issues. Thus, if you read of a study in mice or cells that seems to indicate that “marijuana cures cancer,” remember, the chances that that study will end up being clinically relevant is vanishingly small. There are just too many stories where a big medical advancement is touted in the press, but it vanishes from the radar. And one more thing. We cannot play the argument from ignorance, that is, just because we haven’t shown that marijuana cures cancer, then it’s possible. If there isn’t any evidence that cannabis cures a particular cancer, then that means there’s no evidence. I’m not going to think “oh, they just haven’t tested it on THAT cancer, so how can you not be sure that pot doesn’t cure THAT cancer.” I also don’t have evidence there’s a pink unicorn walking on Mars, so I’m going to stick with a conclusion that there aren’t pink unicorns walking on Mars until such time evidence is brought to my attention. Let’s examine some of the more recent claims. Remember, if some article was published 10 years ago, and there’s not one single follow-up study, it’s a dead end, meaning that no one was able to repeat the data, and it’s probably not a viable treatment. Again, there are lots of research that can never make the jump from pre-clinical, that is, cell-culture or animals, to clinical research. But that’s how science works, ask a question, and find the evidence that answers that question. Cannabinoids: A new hope for breast cancer. “This review summarizes our current knowledge on the anti-tumor potential of cannabinoids in breast cancer, which suggests that cannabinoid-based medicines may be useful for the treatment of most breast tumor subtypes.” Now, you might think that smoking a joint is going to cure breast cancer. No, it won’t. The initial studies are done in cell culture, not in human clinical trials. Furthermore, the active ingredient must be delivered in the correct dosage over the correct amount of time at the actual tumor site to induce the death of those cancer cells. This type of research will take years, even if it is successful. Smoking or consuming pot would never produce a blood THC level high enough to kill those breast cancer cells without causing harm to all of the other cells in the body (see the next section where I discuss the pharmacology of using cannabis for cancer treatment). Chemopreventive effect of the non-psychotropic phytocannabinoid cannabidiol on experimental colon cancer. The authors concluded that cannabidiol, a non-psychotropic ingredient of cannabis, can exert a chemopreventive effect on colon cells in cell culture. But once again, this has been not been clinically established in humans, and it has not been shown whether there is a dose-response between the drug and colon cancer. So, eating a bunch of cannabis is not going to prevent or cure colon cancer, and the amount necessary to match what was used in cell culture would probably be toxic to the patient. Cannabis and cannabinoids anti-tumor effects from the National Cancer Institute. There might appear to be a lot of research into cannabis treatments for cancer in cell culture or animal models – none have been transferred over to human clinical trials. This is not unusual, because even though it seems that there is a lot of research into cannabis and cancer, the total mass of research into other compounds with respect to cancer is substantially larger because the evidence for both mechanisms of the treatment and clinical successes for these other products are much higher. A four-year-old study/editorial published in a top journal concluded that “cannabis-like compounds offer therapeutic potential for the treatment of breast, prostate and bone cancer in patients. Further basic research on anti-cancer properties of cannabinoids as well as clinical trials of cannabinoid therapeutic efficacy in breast, prostate and bone cancer is therefore warranted.” Now, their conclusion was based on preliminary evidence from in vivo and in vitro studies, not randomized human clinical trials. Moreover, I cannot find any publication over the past four years that seem to support the ideas proposed by this study. It seems to be another dead end. Recently, the prestigious National Academy of Sciences, Engineering, and Medicine published a 400-page review of the health effects of marijuana, examining a wide range of potential claims for cannabis. They specifically looked at its effects on cancer and found “no or insufficient” evidence to support marijuana’s use in preventing or treating any cancer, including gliomas, which make up 80% of malignant brain tumors. Of all cancers, marijuana has actually been used to treat gliomas in clinical studies, and no effect was ever found. Let’s say that we actually can gather evidence that marijuana has an effect on breast cancer. First, we need to determine how much active ingredient from cannabis (whatever that may be) actually would kill most breast cancer cells. In one study, the researchers determined that it would take a concentration of cannabinoids of approximately 10 µmol/L to cause the death breast cancer cells in cell culture. So how close to that 3.14 mg/L can we get by just smoking a joint or two? According to research, smoking one joint would give you a blood level of THC of around 1.3-6.4 ng/mL serum, or about .00013-.00064 mg/L. In other words, to get the presumed anti-cancer effect that is described in the breast cancer study, you would need to light up around 1000 marijuana cigarettes per day to achieve the blood level necessary to kill those breast cancer cells. Of course, you could consume this in other ways, for example ingesting it, but again, you’d need to eat more than the equivalent of 1000 joints (because less digestion is less efficient in absorbing THC than the lungs, which is why it is smoked). And these levels may be more generally toxic to the body, in effect killing you before it ever had any effect on cancer itself. You might think that if you got even a low level of cannabinoids in your blood, it’ll still kill some of the cells. That’s not how cancer therapy works. The dose-response of a chemotherapeutic agent like cannabinoids in this example, and do not kid yourself, this is chemotherapy, is adjusted to find the level that kills 100% of cancer cells. Even one left alive can cause a recurrence of cancer. Breast cancer is not a disease to be trivialized with ineffective therapies. If we ever uncover clinical evidence that marijuana “cures” breast cancer, Big Pharma will spend the money researching which molecule is actually responsible for killing the cancer cell, the overall toxic dose where the cannabis (or active ingredient) which harms the body more than cancer cells, the amount necessary to kill the cancer cells, and how to deliver it effectively to the breast cancer cell. So, Big Pharma will patent it, because they did all the hard work, and they will get $10,000 a dose (just a guess). So, let’s be clear. Smoking a couple of joints is NOT going to cure or prevent breast cancer. I have heard the arguments that Big Pharma, the FDA, the National Cancer Institute (if the cannabis supporters even know it exists), and the US Government suppress all the research that shows how great cannabis is for cancer because those groups don’t want marijuana to be legal. As amusing as that ad hominem argument might be (and it’s a fairly amusing one), if cannabis or any of its components actually could show efficacy against any of the 200 or so cancers, Big Pharma would be all over it. Because despite the trope that Big Pharma is hiding some imaginary “cancer cure,” they actually would love to make a huge profit from a “cancer cure.” Which doesn’t exist, but if we’re going to play this game, let’s be accurate. Of course, Big Pharma would not be selling individual cannabis cigarettes, they would be isolating the active ingredient from the plant (or parts of the plant), determining the exact dose that would have an exact effect, determining how to deliver precisely to the cancer site, funding clinical trials, filing documentation with the FDA, then getting it into physician’s hands. 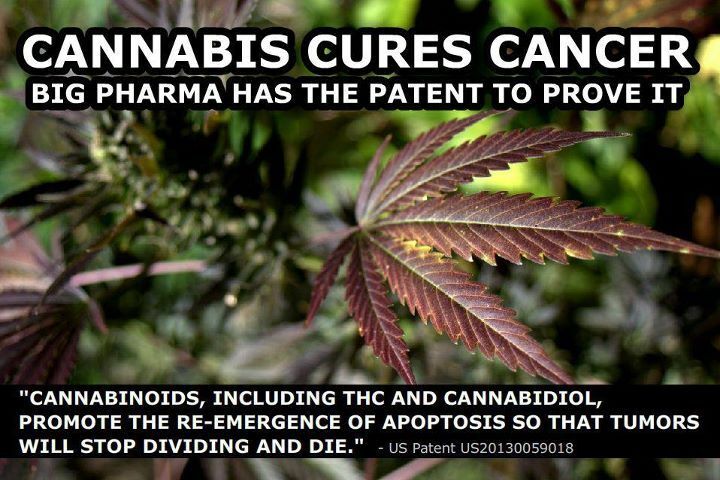 In the meme above, there is an outlandish claim that there is a secret patent that proves that Big Pharma knows marijuana cures cancer. This is ridiculous on many different levels. First, patents are not scientific evidence. A patent can make any number of claims, and they don’t have to be proven, just possible. Is it possible that cannabis cures cancer? Sure, but there is no evidence that it can. Furthermore, a patent such as this one allows the patent holder to protect against future competitors. Let’s say a pharmaceutical company discovers that one component of marijuana, say cannabidiol, can treat a liver cancer. A patent like this one allows the patent holder to get royalties from the specific drug that does one specific thing, treat liver cancer. A method of treating a patient comprising administering a therapeutically effective amount of a cannabis plant extract comprising a phytocannabinoid containing component and a non-phytocannabinoid containing component, wherein the phytocannabinoid containing component comprises at least 50% (w/w) of the cannabis plant extract and in which the principle is not tetrahydrocannabinol (THC) or cannabidiol (CBD), and the non-phytocannabinoid containing component comprises at least 15% (w/w) of the cannabis plant extract and further comprises a monoterpene fraction comprising a principle monoterpene which is selected from myrcenes or pinenes and a sesquiterpene fraction comprising a principle sesquiterpene which is selected from caryophyllenes or humulenes to the patient. That’s very specific scientific verbiage explaining what needs to be done to get a potentially viable drug. It absolutely does not say, “smoke weed, cure cancer.” And it goes to my point that any possible treatment modality that arises from marijuana will be exceedingly complex. And very expensive. Thus, is there any evidence that marijuana cures cancer? Or prevents cancer? Not at this time. Yes, there is some very early pre-clinical evidence that some components of marijuana may have a positive effect on some types of cancer, but we’re decades from having robust evidence supporting such claims. And the reader must be aware of the fact that only a small percentage of drugs that enter pre-clinical studies ever become clinically useful. And it’s also important to remind the reader that if marijuana does show promise, it will be for one, or a hand full of cancers. It will never cure all cancers because that’s logically improbable if not impossible. One last thing. If the goal is to make pot legal, because there’s a group that wants to smoke pot for recreational purposes, that’s fine. But to do it on the back of pseudoscience to prove that cannabis has some medical value that isn’t based on real science? That’s just going to make people dispute all of your claims. There might appear to be a lot of research into cannabis using cell culture and animal models, but none have been transferred over to human clinical trials. This is not unusual, because even though it seems that there is a lot of research into cannabis and cancer, the total mass of research into other compounds with respect to cancer is substantially larger because the evidence for both mechanisms of the treatment and clinical successes for these other products are much higher. If we ever uncover clinical evidence that marijuana “cures” any of the 100-200 cancers, Big Pharma will spend a boatload of money researching which molecule in the marijuana plant is actually responsible for that effect. 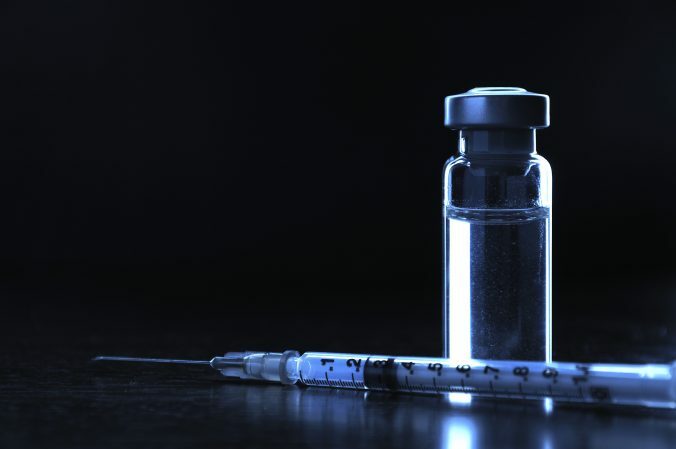 Then they will determine the overall toxicity of the compound, the amount necessary to kill the cancer cells, and how to deliver it effectively to the patient. And at that point, they will patent it, because they did all the hard work, and they will sell the drug on the market. And it’s not going to be in the form of a joint that you’ll smoke (the FDA hurdles for that would be unbelievable), it will be in some highly researched form that allows the active ingredient to reach the target cell. Right now, any claims that marijuana cures cancer is plain nonsense. This article was first published in June 2017. It’s been updated to include any new evidence, to rewrite a few sections, and to copyedit some unclear writing.